Coach Doug Stouffer said that his Wood River High School girls’ varsity soccer team had a tough time in Burley Thursday yet put together a 1-0 victory in a Great Basin Conference match-up. Emerson McCune scored in the 66th minute assisted by Emily Thayer, both freshmen. It turned out to the closest game ever played between the two schools in the 37-game series dating back to 1996. Wood River leads the series 37-0 with 30 shutouts. Nevertheless Wood River (6-1-0, 3-0-0) recorded its sixth straight win. Sophomore goalkeeper Molly Whittington posted her fourth shutout, over Burley (2-4-0, 1-2-0). Stouffer said, “Molly was aggressive again by taking away dangerous chances when the ball was played through the defense. Our defense was unchallenged most of the time particularly in the second half. “We had many more scoring opportunities but struggled with the turf pitch. We didn’t have all players at our disposal with some injuries still lingering, including Jesse Cole. We are hoping to have some players ready to go after a well-earned rest this past weekend. Wood River hosted Canyon Ridge (3-5-1, 2-1-0) on Tuesday and entertains Jerome on Thursday, Sept. 18 at 4:30 p.m. at South Valley Sports Complex soccer field, Hailey. Canyon Ridge was a 7-0 winner at Jerome last Thursday. Twin Falls (5-3-0, 2-1-0) got back on track 14-0 at home over Minico Thursday. They started well, but Wood River High School boys’ varsity soccer players ended up on the short end of a 4-1 score to the visiting Burley Bobcats Thursday in Hailey. Senior Sage Kelly scored on a feed by junior Danny Graves in the 17th minute for a 1-0 Hailey lead. But Burley scored the final four goals of the Great Basin Conference game, three by junior Victor Valencia and two of those coming in a 60-second span of the first half to erase the 1-0 Wood River lead. The Bobcat defense of Hector Magana, Omar Magana, Cole Wright and Efrain Tapia contained Wood River’s offense and limited the Wolverines to just six shots. Defensively, Wood River missed its sweeper Jon Scott, a senior out with an injury. Burley was awarded 10 free kicks in the first half, compared to Wood River’s two, and broke down the usually-tough Hailey defense for a 3-1 halftime lead. Burley (2-4-0, 1-2-0) posted its first win of the season and snapped a skid of six straight shutout losses to Wolverine teams. Since 2009, Wood River was 10-1-2 against Burley before Thursday’s outcome. It doesn’t get easier this week for Wood River (3-4-0, 1-2-0) with match-ups against the top two teams in the Great Basin this year. 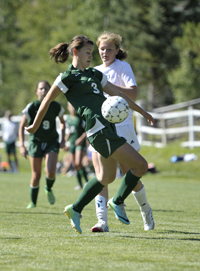 Wood River visited unbeaten Canyon Ridge (8-0-0, 3-0-0) on Tuesday and travels to Jerome (5-1-0, 2-1-0) Thursday, Sept. 18. Canyon Ridge beat reigning league champ Jerome 3-3 (3-0 penalty kick shootout) in extra time after rallying from a 3-1 second-half hole.